In this essay by the author of Militant Modernism: A Guide to the New Ruins of Great Britain and Uncommon, a treatise on the significance of Pulp, feels the political punch in the lyrics of the Pet Shop Boys evident over the course of their career. “Now I’m digging through my student paperbacks,” sings Neil Tennant. “Flicking through Karl Marx again. Searching for the soul of England, drinking tea like Tony Benn.” This is “Love is a Bourgeois Construct”, from the Pet Shop Boys’ twelfth album, Electric. 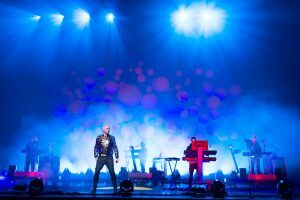 The song is, as always, extremely tongue-in-cheek—the narrator decides that love is a bourgeois construct after being dumped, and then reaches for the Marx; but then for a long time, the Pet Shop Boys have been making records that are alternately about politics and intimacy, or rather the politics of intimacy, writing relationships together with economics. Electric has few surprises—like a lot of late Pet Shop Boys, it sounds like Tennant singing liberal truisms over discarded Michael Mayer tracks. But this little couplet is a reminder that there is something in the Pet Shop Boys’ songs that seldom gets noticed—a red, or at least reddish thread that connects them from the parodic Thatcherism of their early years to the satires on Blairism in 2006′s Fundamental, their last really essential record. The Pet Shop Boys were hardly the first to combine condensed critiques of capitalism with bitter love songs to the point where the two were interchangeable—you can find that in a starker form all over the Gang of Four’s first two albums, or on songs like “Date Stamp” on ABC’s Lexicon of Love—but Tennant honed it to a fine art on the group’s first two albums. The era when they were authentic teen pop stars was also the time that they were the most sharply, slyly politicized. The obvious example of this is “Opportunities”, a song which quickly became a Thatcherite anthem, where “looking for a partner” is both come-on and business deal; the least romantic invitation imaginable, where apparently, “I’ve got the brains, you’ve got the looks,” is a compliment rather than an insult. It’s there too in the study of place in “Suburbia”, somewhere so tedious that petty vandalism, “and in the distance, a police car, to break the suburban spell,” is the only way to make it bearable. 1987′s Actually was nothing less than a concept album about Thatcherite London. Throughout, it’s impossible to tell relationships from politics. In “Rent”, notoriously, the narrator’s declarations of fealty are indistinguishable from the financial arrangement that made them possible, blended elegantly together: “words mean so little, and money less… we never-ever argue, never calculate the currency we’ve spent.” Yet it’s sung in a warm, pleading tone, never degenerating into the cynical and diagrammatic, a record both sympathetic and deeply unnerving. “Shopping” drops the ambiguity altogether and goes for a depiction of utterly ruthless City boys and privatization: “we’re buying and selling your history…it’s easy when you’ve got all the information, inside help, no investigation.” “King’s Cross” darkened this even further, an image of the station where the north meets the capital as an apocalyptic city of the dead. Surely one reason why the Pet Shop Boys never went back to this exact territory—a London of endemic poverty and conspicuous consumption, bankers stepping over the homeless—is that so little has changed since. Actually describes London in 2013 as much as it does 1987. It comes back, however, in Fundamental. On the one hand, there’s more liberal wisdom on the folly of radical change—on the yearning techno of “Twentieth Century” he tells us he’s learnt the lesson that “sometimes the solution is worse than the problem,” but elsewhere the anger comes back—“I’m With Stupid” brings back the personal-is-political metaphors for a vignette on the relationship between Tony Blair and George W. Bush, rendered as a disco farce by Trevor Horn’s knowingly overwrought production. The eye for using quasi-romantic language as political parody is rendered in the broad brushes of a placard: “before we ever met/I thought like everybody did/you were just a moron/a billion dollar kid…I have to ask myself/as any lover might/have you not made a fool of me?” “Integral” borrows the language of Yevgeny Zamyatin’s dystopian novel We for a potted critique of Blair’s ID card scheme (which led to Tennant publicly disavowing his previous support of the Labour Party); and elsewhere, there’s various mordant commentaries on Simon Cowell-issue showbiz. The subsequent Yes, though it lacked the same intensity of focus, had similar moments: on “Building A Wall”, the singer complains that there’s “nowhere left to defect to.” But on Electric, the most damning words are actually someone else’s—with the eye to an incongruous cover that saw them mesh U2 and Frankie Valli, they cover Bruce Springsteen’s ferocious anti-Iraq war polemic “The Last to Die”. At one point in the mid-80s, it might have seemed that nothing was more unlike than the tubthumping, sincere vainglory of Springsteen and synthetic ironists like the Pet Shop Boys. But at this distance, both seem to have been doing the same thing—registering the destruction of the society they knew, and trying to smuggle that into the charts. In electronic music, increasingly as mute and technocratic as a fiscal policy meeting, noticing what might be happening in the world outside is now limited to a duo well into their fifties. It’s as if the shock of the 1980s was so sudden and overwhelming that it had to provoke a response—but the lives lived as transactions that run through Actually are now considered so normal they’re hardly seen as being worthy of comment.